The independent support for local Homeless people is on the rise with local people just getting on and taking action. Ruth Lee and +Neal Emery have been leading the way. Ruth started up a project that she first heard about in America, over there it is called the Little Pantry, here in the UK the Little Larder. 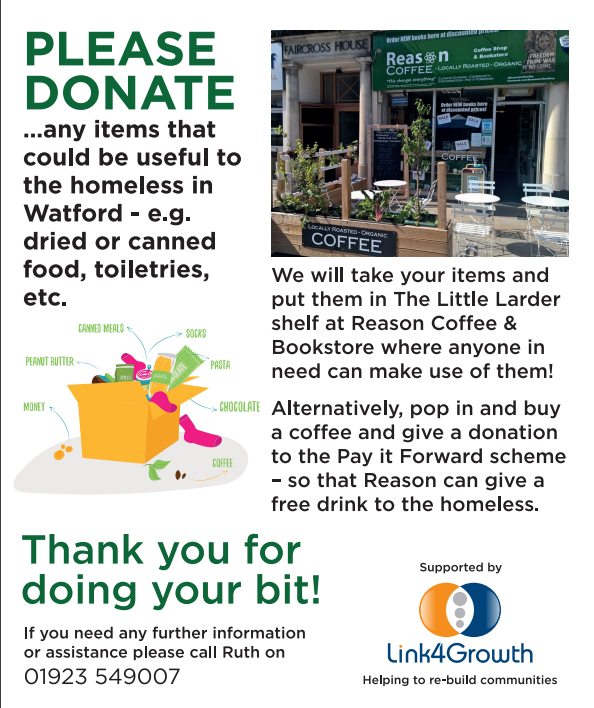 The first instance is outside the +Reason Coffee Shop & Bookstore in #Watford parade, but there are already other local sites being identified and also further afield in other parts of England. 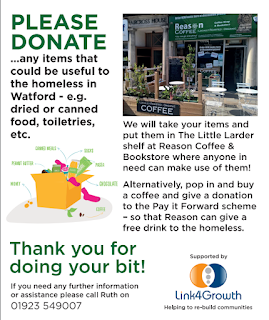 Ruth has now set up a mini website to share what is happening and invite other people to join in Watford Homeless please do take a look. These are great initiatives and there are thousands like them. We can all make a contribution to society we don't need organisations... permission or somebody telling us what to do. All we need is to spot a need, perhaps get together with a few other people and TAKE ACTION. These Google mini websites are all free and easy to produce... if you have a project there really is now no excuse why you can't get something together at no cost and begin sharing the good work you are doing. #Link4Growth in SW Herts is passionate to raise the profile of local Projects in the area... if you are involved in something then please do come along to one of our many events in the area... and let's get CRACKING! ... they are FREE to attend and there is loads of knowledge you can tap into from practical on the ground support through to technology... if it is going to be it is up to WE! email : southwesthertsDL@link4growth.biz ... or visit the Contact Us page and drop us some info about your project.